Home > Patterns > Midnight Glide Pattern 13 1/2" x 21 1/2"
Soaring silently through the night sky this fusible applique Great Horned owl looks as if he is gliding straight at you! This pattern is also wonderful enlarged and feel free to play with the background night sky colors to match your walls. Toni Whitney Design's Who? What? Where? 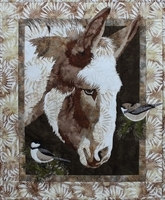 Fusible Applique Raccoon Art Quilt Pattern. This item is NOT a pre-cut product. 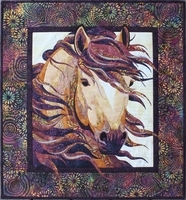 Toni Whitney Designs Summer Breeze, cousin to the original Spring Storm (no longer available). NOT A PRE-CUT KIT. 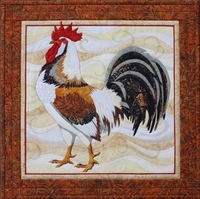 Fusible Applique Art Quilt Rooster by Toni Whitney. This is not a precut kit.